Robometricschool. - One again that we can design DC motor driver using H-bridge MOSFET. In here we find term about H-Bridge. H-Bridge is a form of hardware network that serves to move the motor. 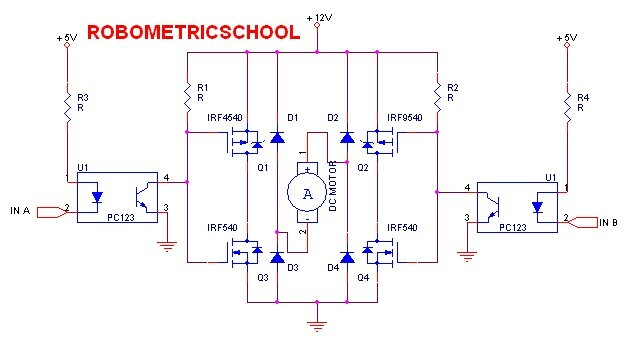 It is called H-Bridge because the schematic like a bridge that can arrange from MOSFET IRF9540 and IRF540. Input A = 0 and Input B = 0, motor will not rotate because all MOSFET IRF9540 work and All MOSFET IRF540 not work. Input A = 1 and Input B = 0, motor will rotate anti clock wise because all MOSFET IRF9540 Q2 and MOSFET IRF540 Q3 work, other MOSFET not work. Input A = 0 and Input B = 1, motor will rotate clock wise because all MOSFET IRF9540 Q1 and MOSFET IRF540 Q4 work, other MOSFET not work. Input A = 1 and Input B = 1, motor will not rotate because all MOSFET IRF540 work and All MOSFET IRF9540 not work. With this circuit schematic in figure 1, we get good security although we give same logical in input A and input B. We can get more power with change all MOSFET series according with current that allowed in MOSFET datasheet. Hi, Thank you very much for the schema , it is very helpful. Thanks for mentioning it, I felt that something was not right. I am trying to design an h bridge to use as amplifier on a rfid system. Would you tell me which values of resistors did you use, as well as diodes? How much current you reckon it is capable to drain? Here, what are ratings of resiator and diode??? In the diagram it was already told about an error. The engine (a point 1) needs to be connected to a joint wire of Q1-Q3, "a point 2" to a joint wire of Q2-Q4. Q1-Q4 transistors have the built-in protective diodes, on it D1-D4 diodes in the diagram are not necessary.